Eastern Skunk Cabbage, a North American native, gets its name from the pungent odor it emits, especially when bruised. Bees, beetles and ﬂies don’t seem to mind; settling on the plants, they pick up pollen from its ﬂowers and transfer it from one plant to another. American Indians discovered its medicinal beneﬁts and used skunk cabbage for a range of problems from coughs to skin sores. Most animals though avoid skunk cabbage because of the burning sensation it causes when eaten. A member of the Arum family as are calla lily and Jack-in-the-pulpit, skunk cabbage or symplocarpus foetidus, a mouthful of a latin name, grows in wet, boggy places. The largest of woodland wildﬂowers, it has a massive central root system. This plant’s most remarkable characteristic is its ability to produce and maintain considerable heat, allowing it to bloom even when the ground is frozen. Over a twelve-day period, this amazing wildﬂower can regulate the temperature, raising it by as much as ﬁfteen to thirty-ﬁve degrees above the air surrounding it. Smart little honeybees use the plant to warm up on cold days on ﬂights between hive and nectar sources. 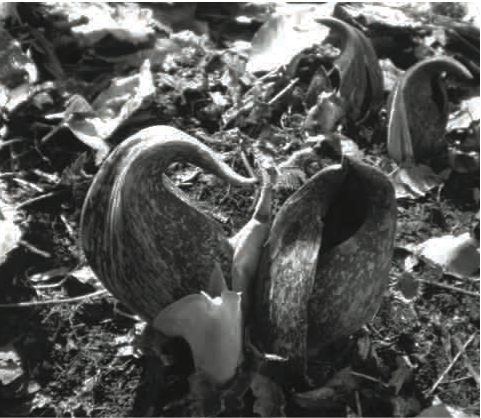 Skunk cabbage ﬂowers develop before its leaves. When the plant ﬁrst emerges, a maroon-colored modiﬁed leaf, frequently mottled with yellow, forms a cup around a ﬂeshy ﬁnger-like yellow spike with petal-less ﬂowers. This hood-shaped leaf curves inward to a tip to protect the spike. As the ﬂowers mature, the leaf-like form unfolds to allow pollinators to enter, then withers soon after the plant has ﬂowered. Nestled next to the spike, you can usually see a pale green bud. The tip of leaf shoots, these tightly scrolled leaves will start to grow by late spring when the plant has ﬂowered, unfolding in a spiraling pattern and eventually becoming large bright green ﬂeshy leaves on stalks that can extend out to three to four feet. By mid-June the leaves begin to decay. After pollination in mid-summer the ﬂower heads swell and develop green berries, each containing two seeds. By August, the fruit head falls apart, scattering its seeds on the ground, where they are ready to germinate into new plants the next growing season.